Congratulations! Your son or daughter has decided to join a school or community band program and has chosen to play the clarinet! Clarinets are obviously the best instrument (although I am a little biased), but it can be overwhelming to purchase a clarinet if you are a first-time band parent. With reeds, mouthpieces, ligatures, mouthpiece caps, swabs, and cork grease, the clarinet has more than its fair share of equipment, which is why I’m here to help. Rent or buy? If you are unsure that your child will continue band past the first year, renting might be a good option for you. Instrument rentals are more common among pricier instruments such as tuba and bassoon because student model clarinets are usually relatively inexpensive. If you are still interested in renting, price shop at your local music stores and figure out the rental cost of a clarinet for one year. Some band programs also offer rental agreements, so be sure to check with the band director to see if this is an option. Carefully read rental contracts and ask if rentals include regular clarinet maintenance, adjustment, or repairs. Some rental programs allow you to use your rental payments towards the cost of purchasing the instrument if you later decide to buy it. If the price seems too high, remember that you can always purchase a clarinet and resell it if and when your child no longer wants to be in band. If you decide to buy a clarinet, the most important thing is to buy from a reputable dealer. Ask your band director for a list of reputable dealers in the area. There are many reputable dealers online (some of which offer trial programs), but when buying your first clarinet, I always suggest buying in person, especially if you are a new band parent. Visit all of your local music stores and inquire about student or beginner model clarinets and their prices. Ask the music stores if any of their staff specialize in clarinet so you can get their opinions on their available models for purchase. Don’t be rushed into making a decision – if you are unsure, wait until you can read reviews of the different models or ask your band director for their opinion. New or used? If you decide to buy a clarinet, this will probably be the first question you get asked. Used clarinets are usually cheaper, but there is always the risk of repairs and adjustments to be made, which adds cost to the final price. If new clarinets are out of your price range, have your band director or a clarinet specialist at the music store test the clarinet to confirm that it is in good playing condition before purchasing. What else do I need to buy? Check to make sure your clarinet comes with five parts (mouthpiece, barrel, upper joint, lower joint, bell). If it doesn’t have a mouthpiece cap (most clarinets come with one), request a plastic one, which are less likely to chip reeds or mouthpieces when you place them on the mouthpiece. You will also need a swab (preferably one without an exposed metal weight, which can scratch the inside of a clarinet), cork grease, reeds, and a reed case. What about reeds? I have always played and preferred Vandoren reeds because they are easy to play, have a great sound, and are very high-quality reeds. Vandoren also makes a student line of reeds called Juno, which are tailored for young clarinet students. Most clarinetists begin on a strength 2 or 2.5 reed (strengths go up to 5+ and the numbers indicate resistance while blowing into the mouthpiece). Even within one brand, there are a variety of cuts (or “models”) of reeds – Vandoren has the Traditional (often called “blue box”), V12, 56 Rue Lepic, and V21, and none are better or worse than the others – it’s entirely personal preference. Instead of buying a whole box, I suggest buying reeds individually so you can try different brands and cuts without committing to an entire box. When your child becomes more familiar with the clarinet, have them try a variety of reeds to see what they like best. The reeds will come in a plastic sleeve, but I suggest buying a reed case which holds multiple reeds. Protec makes inexpensive reed cases which can hold up to 12 reeds. Do I need a special mouthpiece? Mouthpieces will make a significant difference down the road, but for beginner clarinetists, it is unnecessary to purchase a particular model mouthpiece. Since your child will have nothing to compare their first mouthpiece to, the stock mouthpiece (the mouthpiece that comes with the clarinet) should be fine. If your clarinet doesn’t come with a mouthpiece or you want to purchase one, my recommendations are the Clark W. Fobes Debut or the J&D Hite Premiere mouthpieces. Let’s talk ligatures. If your clarinet comes with a mouthpiece, chances are it will also come with a ligature (the piece that holds the reed on the mouthpiece). Much like mouthpieces, ligatures can make a difference down the road, but it is unnecessary to purchase a particular ligature for a beginning clarinetist without any prior ligature comparisons. Any metal ligature will be fine now (although they can also come in leather, string, plastic, or any combination of these materials). Ligatures are either “traditional” or “inverted.” Traditional clarinet ligatures have the screws on the same side of the mouthpiece as the reed (front of the mouthpiece), and inverted ligatures have the screws on the opposite side (back of the mouthpiece). The screws of the ligatures will always go on the right side of the mouthpiece, whether they are traditional or inverted. On a tighter budget? Look at thrift stores, pawn shops, and garage sales for used clarinets. The prices are often much cheaper, but be aware that these will usually need repairs or adjustments to work properly. That being said, you might be able to lower repair costs by taking the clarinet to an apprentice at a repair shop or music store or finding a music student at a local university who knows clarinet repairs. I got the plastic clarinet I used for marching band at a Goodwill for $10, and I was lucky that it didn’t need any repairs! Another option is to contact band parents of older children or post signs in high schools band rooms to see if anyone is selling student model clarinets as they purchase intermediate and professional model instruments. Plan in advance – if band will be in your child’s future in the next few years, keep your eyes and ears open for information. Should I buy a clarinet on Ebay? Probably not. You get what you pay for, and even if the price is right, you’ll usually spend more money on the repairs and shipping than the actual clarinet. Same goes for Walmart – you might think it’s a good idea when you see the price, but you’ll ultimately spend more than the cost of the clarinet on repairs. Have you child swab the clarinet every single time after they play it, or every 30 minutes if they are playing for an extended amount of time. Make sure your child always puts the mouthpiece cap on the mouthpiece when they are not playing to avoid chipping a reed or breaking the mouthpiece. Be sure your child treats their clarinet like a clarinet. When I teach at middle schools, I see young clarinetists use their clarinets as a baton, pretend it’s a flute, shoot it like guns, and all kinds of other ridiculous games. This is a surefire way to break a clarinet. Have your child let you know when they are running low on reeds. Never wait until you reach zero. Remind your child to be very careful with reeds, but be prepared to go through a lot of chipped reeds the first few months. Reed tip: Always put reeds back in their case after each use. A loose reed is a chipped reed waiting to happen. Also tell your child to remove lipstick or lip gloss before playing clarinet – both shorten a reed’s life. Take your instrument regularly for repairs. Have your child let you know when it’s not playing properly so it can be repaired right away. 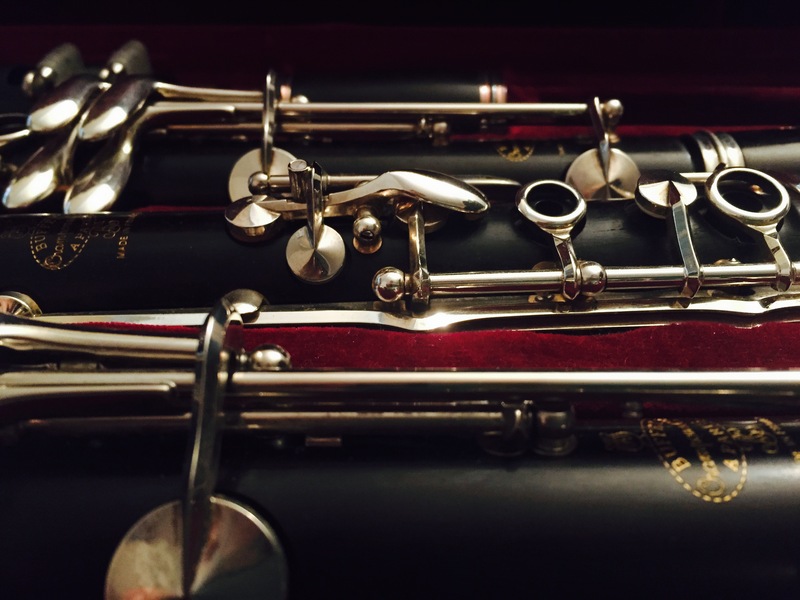 Take in the clarinet during winter break for a check-up to make sure it’s working at its optimum playing level. Keep your pets away from the clarinet! Always make sure your child puts the clarinet back in its case when they are not playing it. Believe it or not, I’ve had a few students whose dogs ate their mouthpieces or chewed on the clarinet (so when they come in for lessons, I guess the dog really did eat their “homework”!). I hope that this information helps as you begin your journey into the wonderful world of band parenting and clarineting! There will be many squeaks and chipped reeds along the way, so don’t get frustrated. Band is a wonderful opportunity to learn music, meet lifelong friends, and create memories that your child will remember for a lifetime! My daughter recently started playing the clarinet, and I had no clue on how to go about buying one for her. Your tips about what to consider before purchasing one are very helpful – thanks! I’m so glad that it helped, and I hope your daughter is enjoying her new clarinet! Let me say when we started we had no clue whatsoever what we were getting ourselves into. Band Director and music store helped, but were we fully informed don’t know…. I mean we were new at this, didn’t even know what to ask. We ended up purchasing it because I realized she was in for the long term. She has been playing the clarinet for 5 yrs. Now she wants another one to have at home and the 5 yr one at school. So to have found your website, really helps me its very informative in all aspects of purchasing a clarinet!! Thank you! I’m so glad it helped, and I hope your daughter found a great new clarinet to enjoy! I’m trying to find out what my premiere hy hite clarinet is worth? Could you please tell me where I can go on internet to find out. I would check out eBay to sell your mouthpiece, but you can get an idea of what these cost new at Muncy Winds or Woodwind Brasswind. Hite Premieres are plastic and relatively inexpensive student model mouthpieces. Hope this helps! Thank you so much I now know what to buy for my 7 year old.. he is very keen on playing the clarinet.